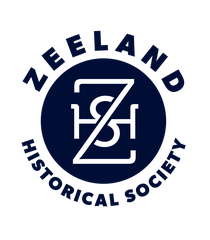 This family tree shows the link between Randall Dekker, who sold the Dekker Huis to the Zeeland Historical Society in 1974, and his immigrant ancestor, Cornelis Dekker. Cornelis and Jannetje (Nederhand) Dekker, parents of eight sons and five daughters, emigrated to America in 1881. Widowed shortly after their arrival, Cornelis moved to Zeeland at the request of his son, Dirk Hendrik Dekker. Dirk Hendrik and Leuntije (de Korne) Dekker built their home and store in 1876. In the family portrait above, seven of their twelve children are shown with little Hendrick "Henry" sitting in the first row between two sisters. Henry opened the jewelry store at this location in 1915, a year after he married Agnes Vander Woude. Randall Dekker was the oldest of three sons born to Henry and Agnes. Interestingly, eleven of the thirteen members in this family tree are buried in the Zeeland Cemetery. Dirk Hendrik Dekker's mother is buried in an unknown location and Leuntje (de Korne) Dekker's father is buried in the Netherlands.